In Petare, Latin America’s largest and most dangerous boroughs, sounds of gunshots break the din of the city. But noise of violence isn’t the only thing to be heard. Young people by the thousands can be heard cheering “goal!” at the top of their lungs as they play Latin America’s favourite sport: soccer. Passion Petare is a foundation that provides youth with soccer programs to keep them out of gangs and lives of violence. It began in 2011 with work municipality and school leaders were already doing, creating spontaneous practices for the children after classes ended. 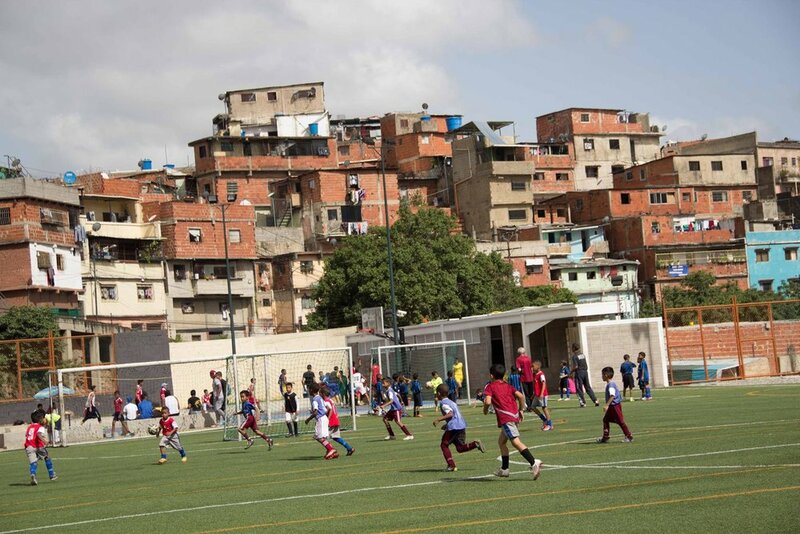 These isolated efforts were combined by Petare’s mayor at the time, Carlos Ocariz, who called the individual community soccer schools together to consolidate and structure their efforts. Eight schools answered and work began. Fields were repaired, equipment was distributed and the coaches were organized. Sonia Pérez, general manager of the foundation, said the program’s needs go beyond just playing the game. “We have to be aware of what the kids need. We realized, for example, that we had to give them shoes, because they did not have any. Besides, we make medical days, we give training to the coaches, we organize vacation plans, we give workshops for parents, among other activities,” Pérez said. Today, Passion Petare has established itself as a large network composed of 24 schools. They schedule tournaments to incentivize dedication to the program. Andrés Parra was trained as a sports coach by the International Federation of Football Association (FIFA). He’s now the sports management of the foundation and supervises the schools. “We usually go twice a week to check that everything is going well, that the children and the coaches are attending [practices], that they use the equipment that we are constantly giving them,” Parra said. Both he and the rest of Passion Petare’s multidisciplinary team – made up of social communicators, athletes and psychologists – recognize challenges off the field can be a heavy distraction. In 2016, Parra realized fewer and fewer young people were playing. Some, because they had left the country; but many others because they did not eat. Parents argued that because of the caloric expenditure involved in soccer training, their children returned even hungrier to homes where there was nothing to give them. So Passion Petare opened canteens for the children. They opened the first one in Villa Esperanza, one of the most disadvantaged areas, which serves 150 children. People from the community organized to take care of food preparation. Children are given food after practice, to return home with full bellies. Now, the foundation is about to set up a second soup kitchen, which will provide 160 children of the Mesuca school, another vulnerable sector, with food. The foundation hopes to find more resources to maintain many others. Pérez said the key to success amidst crisis is finding balance in addressing basic needs and the purpose of the program – soccer. “I wish we did not have to open dining rooms and [could] dedicate ourselves only to football. But if that is what needs to be done for them to play, then we do it,” she said. The team insists it’s worth it. Not only for the numbers – 3,378 children, 33 cups and tournaments – but for the stories found in these statistics. Stories like Meyber Soler’s. Meyber Soler lives in Villa Esperanza. The 17-year-old is exceptional at football. She started in the program but stopped coming because of family problems. “We realized we could not allow so much potential to be lost.,” Pérez said. They created a partnership with the Metropolitan Soccer Club, first division team. There they evaluated Soler’s performance on the field and she got a scholarship at the Santa María University to study social communication. Passion Petare knows this is an exceptional case. But Pérez said it does not matter.